The 2.2.2 version of Magento 2 introduces significant new features that streamline the customer experience and provide merchants with greater insight into their online business. Besides, you will discover numerous fixes and enhancements to core features. And don’t forget about ninety-six bug fixes submitted by the community. The Advanced Reporting functionality is based on Magento Business Intelligence. It offers lots of vital data right in the Magento Admin so that data-driven decision making is no longer a problem. The feature is fully described here: Advanced Reporting. As for Magento Shipping, it is based on Temando. Thus, you get integrated advanced multi-carrier shipping and fulfillment out of the box. For further information, check the following link: Magento Shipping Release Notes. Another stunning improvement to the platform is introduced with the Instant Purchase checkout, which is contributed by Creatuity. 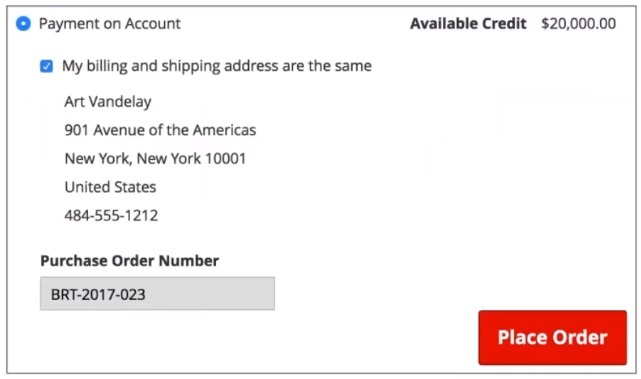 The new option allows using previously stored payment credentials and shipping information to bypass the checkout process and purchase right from the product pages. More information is here: Instant Purchase module. Marketing automation software is a part of Magento 2.2.2 due to the dotmailer integration. It is a strong competitive advantage over other e-commerce platforms. See Email Marketing Automation for further information. An open-source, cross-platform testing solution is also among core platform enhancements introduced in 2.2.2. Meet the Magento Functional Testing Framework that facilitates functional testing and minimizes efforts to perform regression testing. You can find more information here: Introduction to Magento Functional Testing Framework. Better Performance: Improved Indexing, Cache, and Cart. This list of improvements is based on the following Release Candidate release notes: Magento 2.2 Enterprise Edition and Magento 2.2 Community Edition. There are also lots of bug fixes in both Release Candidates. You can find more information about fixed issues by exploring both documents. Unfortunately, the new B2B functionality is available only with Enterprise Edition, but below you will find out how to get the new features or their alternatives on the basis of Magento Community Edition. The first Magento 2.2 B2B improvement is related to quotes. If previously you could receive quote requests only after installing such tools as the Cart2Quote Magento 2 extension, now this functionality will be added to Magento 2.2 and further releases by default. There is a special section in the backend that contains quote requests. As a Magento 2 merchant, you can filter out the selection, use search to find specific quotes, as well as customize them. Quote details are available in a history log. Here, Magento 2.2 allows you to view all updates and communications related to each quote. Furthermore, each quota proposal draft can be saved multiple times until it is ready to be send to your B2B partner. As for the customer side, the new Magento 2.2 B2B feature allows your partners request quotas right from the shopping cart. This approach provides the ability to implement unfixed prices where everyone can recon on the highest possible discount. Both comments and documents can be added to quote requests. And while in a customer account, it is possible to view quote details as well as attached documents. Another important Magento 2.2 new B2B feature allows to set expiration date for quotes. From the merchant side, Magento 2.2 allows to view such information as total cost data, calculate and apply discounts, negotiate with B2B partners about product price and shipping conditions, as well as suggest substitute products. The information about the possibility to hide prices is still unknown, so if the feature won’t be implemented in Magento 2.2 by default, you can easily get it with the help of appropriate extensions by Amasty, Ecomwise, or Cart2Quote. 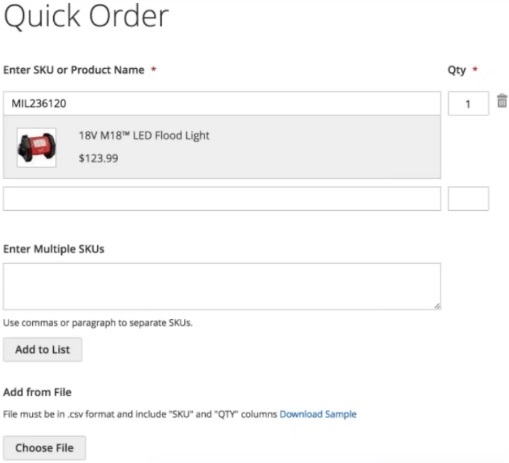 Another great Magento 2.2 new feature is the ability to place orders as fast as possible by entering SKUs or even uploading a CSV file with necessary data. Note that you can specify one SKU at a time and set the quantity of the corresponding item. Besides, Magento 2 allows to enter multiple SKUs simultaneously. As for the uploaded CSV file, it must include two columns: SKU and QTY. You can download a sample to see its structure. Now, fast ordering is available with such tools as Ecomwise B2B Orderlist. Unfortunately, subscriptions and recurring payments are not included into Magento 2.2 features, but the new platform version introduces accelerated ordering with requisition lists. As a store owner, you can create multiple lists of frequently purchased items and assign them to specific buyers. 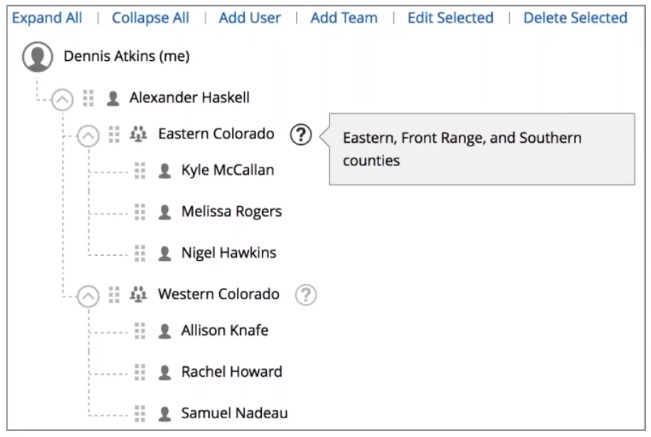 B2B clients can add products to each list by entering SKUs, copying already completed orders, or adding products from category and product pages (via “Add to Requisition List” button). 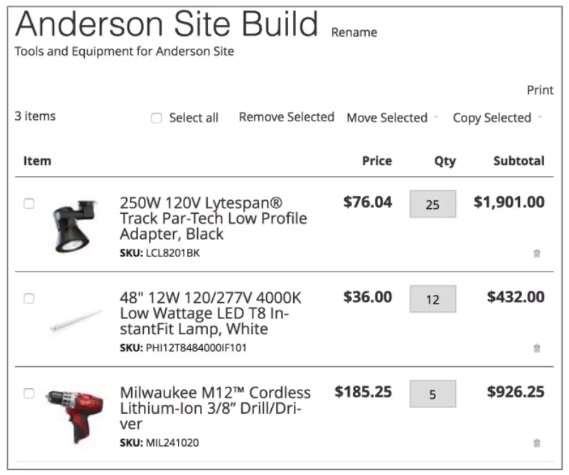 From the customer side, the requisition list displays product name, SKU, price, and subtotal. A customer can change quantity of each product manually right there. Besides, it is possible to create and manage several requisition lists from frontend. Want to have multiple buyers per one account? This feature will be finally implemented in Magento 2.2. Today, you can get the desired functionality with the AIRBYTES Sales Staff Magento 2 extension or a similar tool. As for the default Magento 2.2 feature, it allows to create and assign various roles and all possible permissions to each buyer. As a result, it is possible to fully control what can be viewed or edited by the user. The new platform version allows to create company accounts that represent the existing company structure. The corporate account can be managed from the frontend, so no merchant’s interaction is necessary. A B2B client can easily add or remove new company users, define roles and permissions, as well as view orders and quotes, credit balances, and company information. Alternatively, you can use Amasty Sales Reps and Dealers for Magento 2. 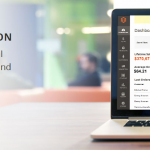 Magento traditionally provides credit card payments or PayPal as available payment methods, but with Magento 2.2 the new option will be added – Payment on Accounts. It introduces fully configurable credit (with limits and conditions) provided to selected B2B customers. You can restrict credits for specific countries as well as set a limit for minimum and maximum order amount that allows to choose credit as a payment method. 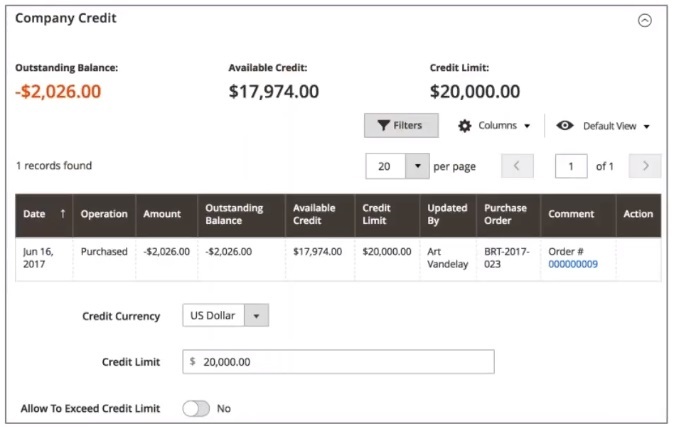 You can view current credit amount (Outstanding Balance), available credit, and credit limit. Information on each order is available in a grid below. Note that it is possible to specify individual credit currency and limit for each user as well as allow to exceed the existing credit limit. 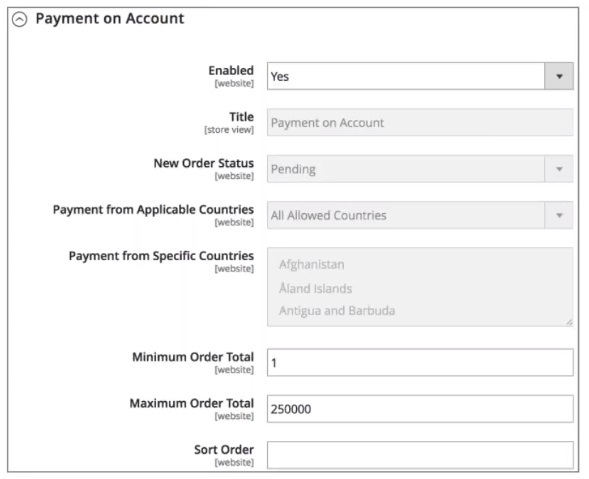 From the customer side, this Magento 2.2 feature allows to view the existing credit before placing a new order. Besides, it is possible to enter a purchase order number to be able to track order history. The feature is not mandatory. It illustrates the same information as shown in the backend grid as well as displays the author of the latest update. Something similar is now provided by Ecomwise Credit Limit for Magento 2. 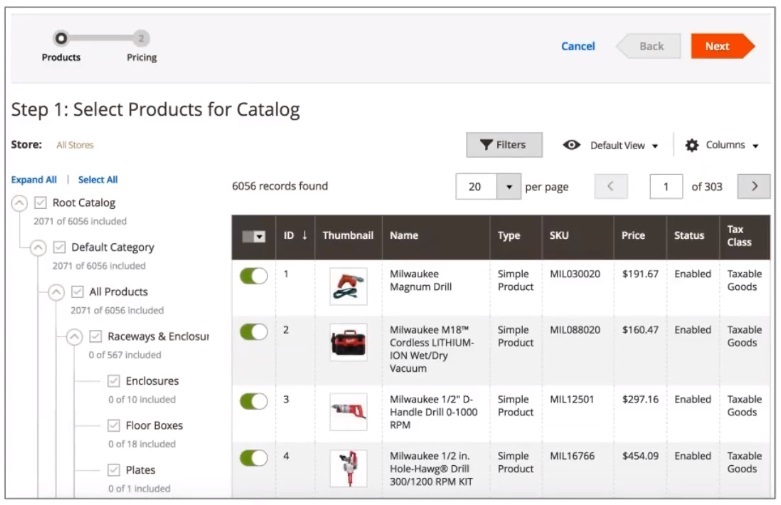 Besides, Magento 2.2 new features includes customizable catalogs and price lists. This important B2B feature is available in earlier Magento 2 versions with such modules as Amasty Customer Group Catalog or MageDelight PDF Catalog Print Advance. Now, the platform allows to control prices, products, and categories displayed to your business partners. The process of catalog creation is divided into several steps. First of all, it is necessary to select products that will be displayed in the new catalog. Filters can be used to include/exclude specific products. Next, specify prices. Note that it is possible to set individual discount on per product basis, set new fixed prices for each product, as well as apply one discount to all products in bulk. The process of catalog creation runs in the background, so you can manage other activities while it is generated. The system will notify you when the catalog is available. It can be assigned to multiple customers. Magento 2.2 B2B functionality includes advanced shipping as well. 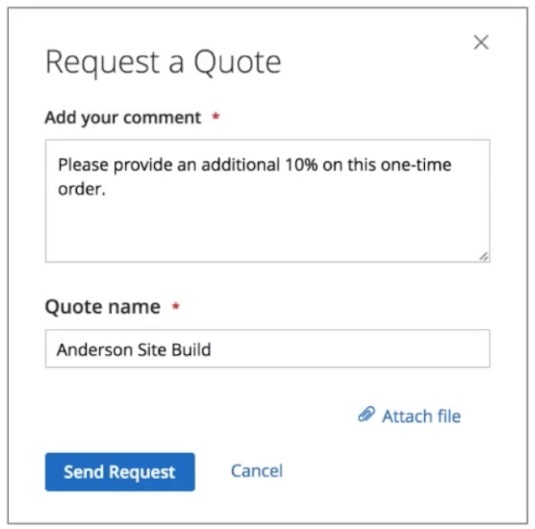 The new platform version automates carrier selection, supports packing and dispatching from any location, allows to create various rules and restrictions (you can still use Amasty shipping rules and restrictions). To find out more ways to get even better shipping conditions, follow this link: Magento 2 Extensions for Custom Shipping Methods And Rules. Improved ERP Integration. 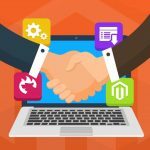 Magento 2.2 provides APIs for all new features, so it won’t take much effort to connect the new version with the existing ERP services. Of course, modules used for ERP integration, must be updated to support the new B2B functionality. It is also necessary to mention that updating product prices in bulk will be easier with the new Tier Price API. Developer Features. Various developer-oriented features include improved performance toolkit, better cron and JS exceptions logging, enhanced plugin debugging, revamped deployment flow with much higher efficiency, etc. Security Improvements. Magento 2.2 security also reaches a new level due to 2 core improvements: unserialize() calls are removed and hashing algorithm is revamped and upgraded. Besides, there is 100% chargeback protection with Signifyd. The same integration provides advanced level of fraud protection, so you can easily reject roguish orders. For third-party fraud detection, check this module: Mirasvit Fraud Detection Magento 2 Extension. Advanced Reports. Previously we’ve compared various Magento 2 modules that provide advanced reports – Magento 2 Advanced Reports Comparison – and now Magento introduced much better reporting system with the new version. Are third-party modules still necessary? Definitely, yes. Better Productivity. Updated technical stack and improved indexing are introduced in Magento 2.2. 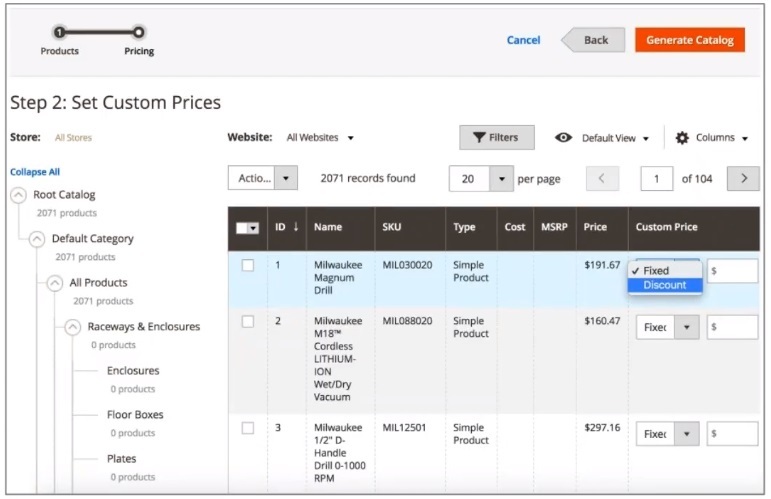 People can now brows your store and make purchases during indexing. As for technical stack update, it includes PHP 7.1, MySQL 5.7, Redis 3.2, Varnish 5, etc. PHP 5.6 and Varnish 3 are no longer supported. 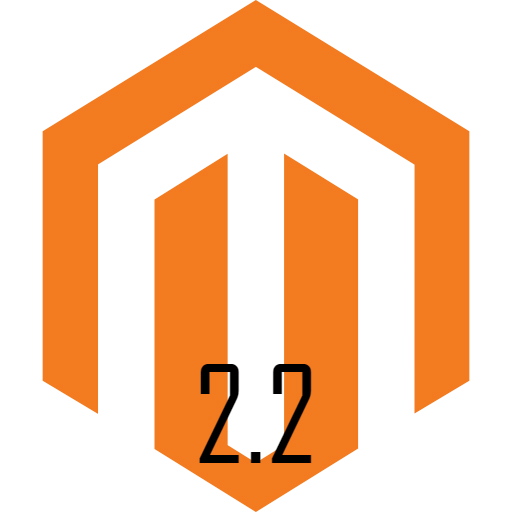 It seems that Magento is going to make a big push with the release of 2.2. Lots of features that are still available with third-party modules only will be added to the default platform. Will this update reduct the importance of already existing extensions? We don’t think so, and there are at least two reasons. Not everyone will upgrade to Magento 2.2 right after its release. Therefore, lots of B2B Magento 2 merchants will still need the aforementioned extensions to provide advanced B2B services. The second reason is even more interesting: extension providers will upgrade their products to make them better than they are now and improve their quality in comparison with alternative Magento 2.2 features. 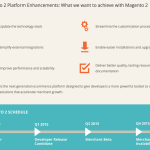 Thus, the new platform release will push the whole ecosystem of Magento 2 B2B extensions forward. Thus, there are no reasons to worry about. All major releases are always followed with bug fixes and improvements. It is hard to create an ideal major release, so we insist on using third party modules and watching the development of Magento 2. You will always know when the new release is safe enough to be updated to. And even if you are on Magento 2.2, it doesn’t mean that you must use the default functionality: third-party modules may still be better. You can watch Magento 2.2 webinar for further information. The most useful Magento 2 B2B extensions: Magento 2 Business-to-Business Extensions and Solutions.